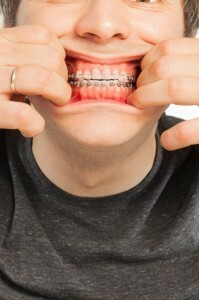 Here's something you already know: braces can cause some discomfort, especially around your lips, cheeks, and tongue. But there's good news: At GKG, our orthodontists and treatment team has a number of ways to help with the pain and discomfort that comes from friction against the braces or a stray wire. We want you to feel good while your teeth are being straightened. Use orthodontic wax. The best way to deal with the pain is to apply orthodontic wax to the brackets or wires that are causing the discomfort. Be sure to only use orthodontic wax. No bees wax here:) Ask your orthodontist or the assistant working with you for a supply of wax to take home, if you run out, just give us a call and you can pick up some more. If its a weekend, check your local pharmacy for orthodontic wax. Nibble soft foods with your front teeth. It's true: how you eat is almost as important as what you eat, and if you train yourself to put minimal stress on your braces from the very beginning, you'll make your life a lot easier for the entire process. The first few days after you initially get braces on or after you have them adjusted can be painful. Just take it slow and eat mindfully. Use your very back teeth and the side of your mouth, too. Your braces will experience much less pressure and damage if you learn to use your rear molars and the sides of your mouth to chew, and taking smaller bites will help as well. Wear lip balm or chapstick when you go for checkups and braces adjusted. The greatest strain on your lips is when they're stretched and stressed during visits, so take the time to “prep” them with a lip balm. A little special attention will prevent you from getting dry, chapped lips afterwards. In the first few days after you get the braces … try not to let your bottom teeth touch your top teeth. Putting braces on is a big change for you and your mouth, and much of the pain and discomfort that you experience is most pronounced in the first few days. Part of that is simply getting used to the new 'experience' of having braces at all; part of it is the physical process of your gums, lips, and tongue adjusting to the new demands of braces. You can reduce the strain on your mouth during those first few days by temporarily altering the way you eat and what you eat. Stick to soft foods for a while, and try to keep your bottom teeth from touching your top teeth. You'll adjust soon. Things will get easier. Don't mess with your grill. Your braces and appliances have been carefully made and expertly placed, but that doesn't make them indestructible. The fact is, wires can break easily, especially if they're fiddled with, and repairing or replacing broken brackets can be expensive and time-consuming … and even worse, it may prolong your treatment. Braces can be a challenge, but remember: straight teeth, better dental health, and a lifetime of beautiful smiles make it all worthwhile. And there are ways you can make the whole process far less difficult by following these simple tips. Whatever the cause, pain is never fun and always something we want to help you avoid. If you have any questions about your braces or any pain in your mouth, please don't hesitate to ask Drs. Grady, Kastner, and Gornick during your next visit to our Wexford, PA office.